Spike`s FLEX Plus was designed to be the most versatile, upgradable, and longest lasting small batch fermenter on the market. With currently over 20 assessories (and counting) you`ll never run out of fun toys to bling your FLEX Plus out with. The FLEX Plus is the big brother to the standard FLEX. Out of the box it features an upgraded tri-clamp racking arm, tri-clamp butterfly valve, and an upgraded high pressure lid and clamp that can handle up to 15psi. 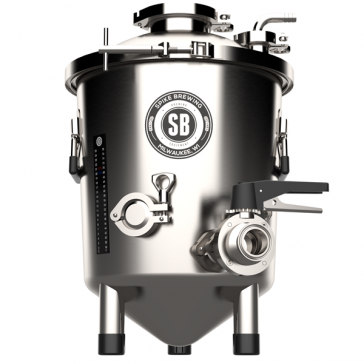 The higher pressure rating allows for carbonating your beer in the same tank you ferment in. Carbonate your beer in 24hrs, not 7 days! 1.5" tri-clamp secondary port for thermometer, sample valve, etc.